I'm back in LA from cold Tokyo now. 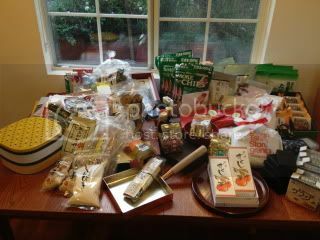 Yes, I did tons of shopping (mostly food and clothes) in my short stay in Tokyo...I went there with an almost empty suitcase, and came back to LA with each extremely packed suitcase, carry-on bag, and large box. For tea only, I spent more than $200 worth. These are basically all for my personal consumption. I do this at least a few times a year, but I always feel I forgot to buy something. 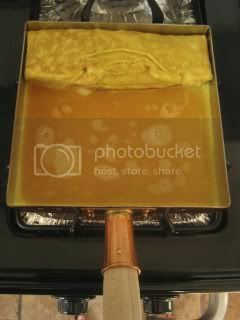 I brought back a professional-use copper "Tamago-yaki" (Japanese omelet) pan. This gorgeous seamless traditional omelet pan is a handmade by an artisan maker. The size is about 7" x 7" (18 cm x 18 cm). Before the use, you need to season the pan. You fill the pan up to 75 - 80% full, and heat over very low heat for about 20 minutes. Once it's cooled down, you drain the oil and wipe throughly so that the oil coats all over the inside. I used about 3 cups (750 ml) oil for this! 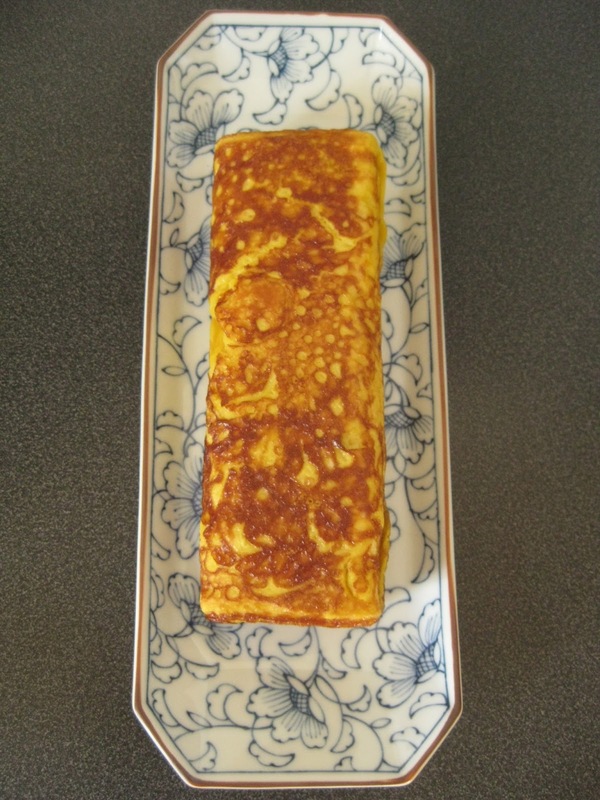 The pan was seasoned, so I was ready to make a simple "Tamago-yaki". 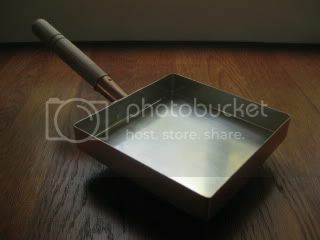 Wow, this pan worked so good! Because the copper conducts the heat so well, with low heat, eggs can cook really nicely. 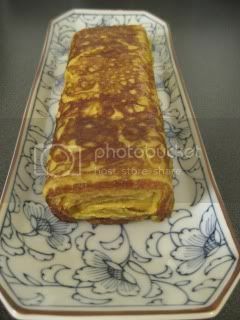 It made the nice even brown marks, and I could also roll the omelet very easily. Fabulous. 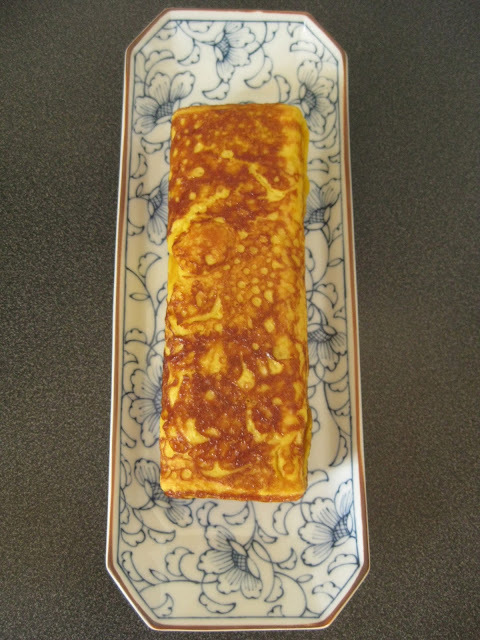 Here's my very homy Tamago-yaki recipe. 1. In a bowl, whisk together the eggs, sugar, mirin, soy sauce, and salt. Set aside. 2. Pour 1 tablespoon of vegetable oil into a omelet pan and heat over low heat for a few minutes. Make sure the oil coats all over the inside of the pan. 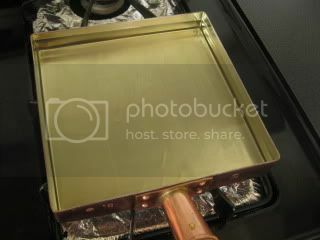 Drain the oil, and wipe the inside of the pan with paper towel. 3. Set the pan back to low heat. Test the pan by dropping a little splash of the egg batter. If it makes the nice sizzling sound but doesn't burn too quickly, it's ready. 4. Pour a ladle of the egg batter (about 1/3 cup or 75-80 ml) to the pan and evenly distribute it by moving it. Turn the heat to medium Once the surface is still wet but not runny, roll the egg from the further end in 3-4 times with chopsticks or spatula. 5. Rub oil to the empty part of the pan. Slide the rolled egg to the further end from you and rub more oil to the just emptied side. Add another ladle of the egg batter and distribute it evenly. 6. Repeat the process (4 and 5) until all the batter is used. 7. Press the omelet gently to closer side of the pan to you with a spatula to make sure it's a nice rectangular shape. 8. Transfer to a plate. Let it cool down, slice, and serve with grated daikon and soy sauce.